Feel the freedom of bohemian style. Unconventional and artistic, Boho Boutique's uninhibited designs reflect a fresh take on today's trends. 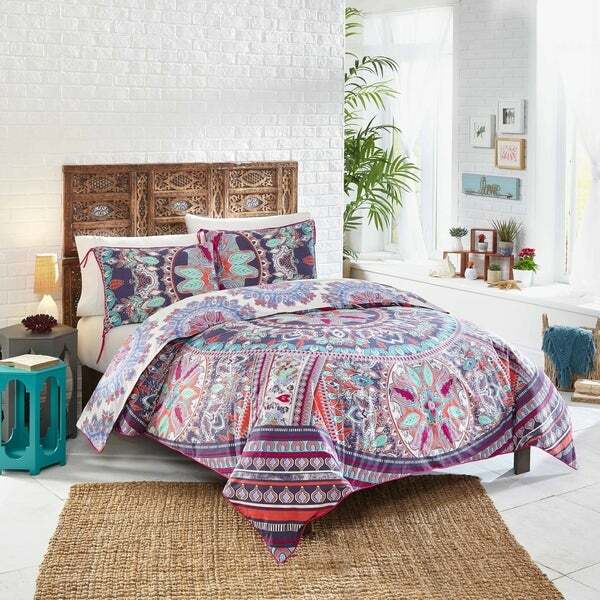 Experience fashion with a free spirit with the Boho Boutique Beach Babe Comforter set. Inspired by the ombre tones of the Malibu sunrise, this print brings a touch of the Pacific Ocean to your bedroom. A multi-faceted pop of jade, magenta, and coral adds a touch of bohemia in a bold saturated print. Truly two beds in one, the comforter and shams reverse to feature a coordinating kaleidoscope pattern of cobalt blue and magenta medallions. Magenta piping adds the finishing touch to the comforter, and playful styling detail to the corner ties on the shams. Pretty addition to my bedroom. Love the Boho theme. I have a colorful bedroom and this comforter ties a the colors together. Yes, I would recommend this product to a friend. Got this for my daughter for Christmas she loved it! It was soft and super comfortable! She loved the style and pattern!! Free spirited just like her. It's beautiful and very comfortable. Great for my boho guest room. Beautiful, rich colors with a vibrant print for a perfect boho look. Looks great in our guest bedroom! It's all one piece so it's a little bulky to wash, but still works in front loader.